Home / Relationship / Narcissistic Victim Syndrome: What the heck is that? 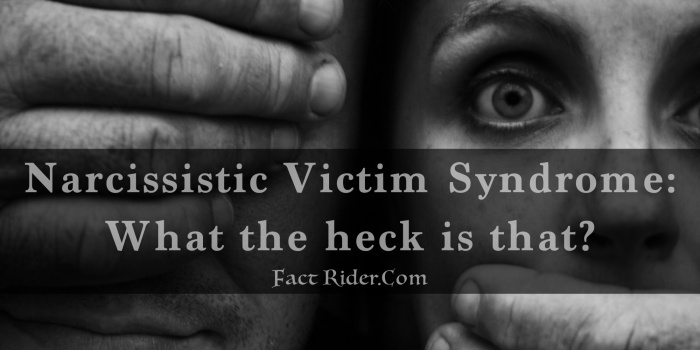 The dysfunctional behaviour involves such callous exploitation of their victims that it has given birth to a new condition known as Narcissistic Victim Syndrome (or Narcissistic Abuse Syndrome). While plenty has been written medically about Narcissistic Personality Disorder (NPD), little or nothing has been written about Narcissistic Victim Syndrome (NVD). The Diagnostic and Statistical Manual of Mental Disorders (DSM-IV), which is published by the American Psychiatric Association, and it is considered the “bible” for all professionals, covers NPD extensively. However DSM-IV has not written anything about the effects on those who live or work with the narcissist’s torturous behaviours, and the consequences of that behaviour on the mental health of the victim. Thanks to the dedicated work of many psychotherapists, it has become clear that a set of detectable characteristics occur when working with victims of narcissistic abuse. The good news is that American therapists are calling for the recognition of this syndrome to be included in the next Diagnostic and Statistical Manual (DSM-V, to be published in 2013), in the hope that all therapists will be given standard guidelines for formulating a way of working with this syndrome. First, What do we mean by “Syndrome”? The word “syndrome” comes from the Greek “syn”, which means together, and “dramein”, which means to run. So a syndrome is a set of signs and symptoms that tend to run together in a cluster that can be recognized as causing a physical, mental, emotional, and spiritual abuse. In order to be able to diagnose a client suffering with Narcissistic Victim Syndrome, the therapists needs to be able to gather together the signs and symptoms and access the client’s psychological make-up as their story unfolds. That way they will be in a position to know if the person is suffering from Narcissistic Victim Syndrome, or a lesser form of abuse on their mental well-being. Do therapists know enough about the effects of Narcissism on the Victim? Speaking for psychotherapists in Ireland, I can confidently say “definitely not”. Narcissistic Personality Disorder is predominately the domain of psychiatrists, psychologists, and the mental health services; so naturally, rarely would a diagnosed narcissist be consciously referred to a psychotherapist outside of the Mental Health Services. Naturally, as a consequence, the mental health services only concentrated on the vulnerability and treatment of the narcissistic patient in their care, their priority is not the victim; unless the victim ends up in psychiatric care themselves somewhere down the line at a later date. Victims are more likely to present themselves in counselling or psychotherapy, not because they know that they may be suffering from NVS, but because they are not coping with their lives. I have spoken to many other psychotherapists, and although they know of narcissism, none feel that they have been sufficiently trained for recognizing narcissistic behaviour and its effects on victims, let alone work with Narcissistic Victim Syndrome. Because most Irish psychotherapy courses do little or no training in this area, and the fact that little or nothing has been written in the medical literature regarding the victims of narcissistic abuse, it is my observation that, the majority of therapists, through no fault of their own, are ill equip to work with clients with this syndrome. If you read any of the Support Forums for survivors of narcissistic abuse, you will constantly hear them say that their therapists did not understand the depth of suffering they had been subjected to, and that the term “narcissistic abuse” had rarely been mentioned to them. In order to be an effective therapist in the area of narcissistic victim abuse, it is vital to understand all that you can about the spectrum of narcissistic behaviour. The spectrum of narcissism exists on a continuum, from healthy narcissism, to unhealthy traits, and all the way to pathological Narcissistic Personality Disorder. By the way, the narcissist does not have to display all of the traits associated with the full blown pathological stage of narcissism in order to do untold damage to their victims. For that reason, therapists need to familiarize themselves about narcissistic traits and the relationship dynamics between the narcissist and their victim. I am talking about the narcissists overwhelming need for entitlement, control, power, grandiosity and specialness, and how they use these traits to keep their omnipotent fantasies and their vulnerable ego in tact. Due to their own lack of receiving reasonably attuned care-giving as a child (whether it was being under protected or over protected), the narcissist does not develop the authentic “True Self” that is necessary for confident living. A disregard of the child’s basic needs disturbs their development of self-esteem and the ability to function effectively. In order to protect themselves, they invest a lot of energy building up defenses. One of those defenses to is develop a “False Self”; which is a mask of behaviour that allows them to put on a show of being real in public. However, this pretense leaves the narcissist constantly guarding themselves from being “found out”, making them overly sensitive to narcissistic injury. Narcissistic injury is any perceived threat (real or imagined) to the narcissist’s self-esteem or self-worth. So in order to maintain their illusion and protect their false self from any fluctuations of a disappointed ego-ideal, the narcissist demands that they receive perfect mirroring, stroking, and responses from their victims; this attention is known as narcissistic supply. Primary Narcissistic Supply provides all of the attention that the narcissist addict craves. The nature of the attention can be experienced in either a public form (such as fame, celebrity, notoriety, or infamy etc. ), or in a private form (such as admiration, flattery, acclaim, fear, repulsion etc.). Secondary Narcissistic Supply alludes to those people or things that provide supply on a regular basis (such as a spouse, children, friends, colleagues, partners, clients, etc.). This latter form of supply allows the narcissist to lead a more normal existence, it provides them with pride, financial safety, social distinction and the alliance that they need. However, narcissistic supply is not confined to people only, it can be applied to any inanimate object that has the ability to attract attention and admiration to the narcissist, (for example, a flash car, property, clothes, being a member of a church, cult, club, or a business). In short, anything that acts as status symbols for the narcissist is “narcissistic supply”. The therapist will also need to know how these behaviours go hand-in-hand with the obsessive multi-addictions of the narcissist. Obsessed by the illusion of a False Self, and an inflated sense of their own superiority, power, and control, the narcissist renders himself susceptible to all sorts of obsessions, compulsions, and addictions; such as, addiction to Narcissistic Supply; to Grandiosity; to Control, to Power; to Rage; to Perfectionism; to Attention; to Fame etc. Without a comprehensive knowledge of narcissism, a therapist has no way of understanding the devastating effects of the narcissistic abuse on the victim they are treating, effects that are so crippling that they can result in Narcissistic Victim Syndrome. To-day I do a great deal of work in this area, and my mission is to teach other therapist all that I have learned, so that they too can become more effective in working in the area of this form of abuse, which is very much on the increase. My intention is not to “bad mouth” those who are suffering from Narcissistic Personality Disorder, on the contrary, I believe that they are also victims of abuse somewhere in their past, and they too suffer greatly on a daily basis. What I hope is that my study will allows for more compassion towards both the narcissist and the victim, and provide therapists with insights for a better way of recognizing and working with narcissistic abuse in the therapeutic process. First, what is the definition of the word “Victim”? – “A victim is a person harmed, injured, or killed as a result of a crime, accident, or other event or action”. So I think we can safely say (using this definition), that any person who has experienced narcissistic abuse has been harmed, injured, and in some cases, even killed as result of the narcissists behaviour, then they are indeed victims. When working with individuals who are displaying symptoms of narcissistic victim syndrome, the thing that I notice most of all is that the person feels so torn because they don’t understand what has happened to them. Before they can begin to put themselves back together, I believe that it is vital that the therapist must, through the process of the therapeutic work in progress, educate the individual in the area of Narcissistic Personality Disorder (the What, the When, the How, and the Why of the abuse etc) so that they can begin to make sense of what was really happening as their story unfolds. Without such information it is virtually impossible to build up their self-esteem to healthy levels, thus leaving them vulnerable to further re-victimization, and future entrapment with other narcissists. Once a person has become a victim of a narcissist (whether it happened in childhood or later on in life), the victims are already unconsciously primed to enter the narcissist’s “convoluted dance” that opens them up to further abuse. It is necessary for the therapist to gently shine a light on what they are doing in the dance that makes them a victim. Once again, a “Narcissistic Victim” is any person who is harmed, injured or killed by a person who displays pathological narcissism (which can occur on a spectrum of severity). The victim needs to understand that this “dance” of codependency requires two people: the pleaser/fixer (victim), and the taker/controller (narcissist/addict), together both partners dance beautifully in perfect step, and the madness begins. The consequences for the victim not understanding the intricacy of the dance, is that, no matter how often they try to avoid “unhealthy” partners, they will find themselves habitually returning to the same dance floor; the only thing that will change is that they will find themselves dancing to a different tune, but always the personality of the dance partner remains the same. Therapist need to be seriously aware that narcissism is a very complex disorder that creates a lot of suffering, both to the person who has the disorder, and to those people who have to live with the disordered narcissistic behavior on a daily basis. When I speak of narcissistic abuse, (abuse that can lead to Narcissistic Victim Syndrome), I am speaking about a form of abuse that is very insidious. What I mean by insidious is that the abuse is covert, cunning and often indirect. This form of abuse is often carried out in a subtly and clandestine manner, because narcissists go to great pains to avoid being observed publicly as being abusive. This Dr. Jekyll and Mr. Hyde behaviour of the narcissist (loving one minute and totally enraged the next) can inflict great harm on the victim. Understandably, the fear, distress, confusion, inner turmoil, and chaos that they experience leaves them “walking on eggshells” in order to avoid further conflict with the narcissist. The effect on the victim over time can be very crippling indeed. I liken narcissism to a parasitic worm that manages to penetrate under the skin, where it is out of the sight of witnessing eyes, but is free to injure or consume its host slowly, leaving trauma or disease in its wake. By the way, the narcissist can manage to live on inside the victim even after they manage to escape; it is as if their “seed” goes on. However, when we speak of Narcissistic Victim Abuse, we are speaking of an abuse that has been caused by someone with a personality disorder, and more often than not, their personality disorder has not been medically diagnosed, therefore the narcissistic individual goes undetected in society (i.e. in the home, the work-place, in organizations, in social settings etc.). It is vital to understand that narcissistic personality disorder is a serious mental disorder in which people have an inflated sense of their own importance, and a deep need for attention and admiration. The narcissist believes that they are superior to others, and have little regard for other people’s feelings, regardless of whom they are (i.e. spouse, children, parents, siblings, friends, colleagues, peers etc.). Other people are merely object there to serve their every need as narcissistic supply, and they will use every form of abuse, without guilt, empathy or conscience, in order to make sure that their needs are served. What do victims of Narcissistic Victim Syndrome look like? Are these clients likely to come into the therapy room and say “I am the victim of narcissistic abuse”? The answer is, absolutely not? They will look like any other client coming into your therapy room for the very first time. They are probably most likely to bring in an issue that is quite mundane and recognizable; such as, they are feeling depressed, having panic attacks, or the feeling that they cannot cope. They have no idea that they have been living in a “war zone” with a narcissistic personality in command (either in the past or in the present). However, you, as the therapist, do not need to be afraid that you will not be able to cope with this syndrome. If you have completed your training, then you should have all the skills necessary to work with this syndrome. Armed with knowledge of narcissistic abuse, and practical skills of working with trauma, you will become a life-line to any victim of narcissistic abuse. Like all clients coming into therapy, they have a story to tell; therefore they need someone to become an active listener, and to validate what has happened to them. To my mind, it is the validation of the person’s experience that is vital from the very beginning. These clients are not mad, however, frequently they appear highly strung or nervous, and their levels of fear may be high, while their level of self-esteem is low. Often they present with obsessive compulsive behaviours, phobias, panic attacks, so at times they may actually feel that they are going mad. They may experience insomnia, and may have underlying eating disorders, so you may notice they are either under weight (as a means of having some control), or overweight (as a result of eating to self-comfort). When working with NVS, you will find yourself working with emotions involving shock, anger, fear, and guilt. Often the victim will be suffering from PostTraumatic-Stress Disorder (PTSD), or Complex Post Traumatic Stress Disorder; Symptoms of PTSD are often grouped into three main categories: Re-living (flashbacks, hallucinations, nightmares etc), Avoiding (people, places, thoughts, loss of interest etc), and Increased Arousal (excessive emotions, problems relating, difficulty in sleeping and concentration, outbursts of anger, anxiousness, panic attacks etc). You may also notice that your client is inclined to “dissociate” while you are talking to them. That is, it seems as if the client is tending to “compartmentalize their experience.”; in so doing, they may appear to be detached from their emotions, body, or immediate surroundings, this experience is called derealization. Dissociation can be caused as a direct result of trauma, often experienced in multiple forms during narcissistic childhood traumas (i.e. physical, psychological and sexual abuse). The dissociation is an automatic and effective defense mechanism to overwhelming acute stress the child is being subjected to; it is as if the child “jumps out” of their body in order to disconnect from the intolerable reality of the abuse while it is happening; by dissociating, the child is able to endure the highly traumatic experience without having to fully experience it. I once worked with a client who was sexually abused as a child by her narcissistic father. He would call her in when she was playing outdoors with her friends, he would sexually abuse her, then send her straight out again to play. She recounted how, during the sexual abuse, she would escape out of her body, get up on top of the wardrobe and watch what was happening to the child in the bed. She referred to the child in the bed as the “bold girl”, and the child on top of the wardrobe as the “good girl. The bold girl never went outside the house, it was the good girl who went back out to play with all her friends. This defense mechanism protects the child against total annihilation of the self when their nervous system is strained to the limit. However, the long term effect of dissociation is that it may decrease the victim’s psychological functioning and adjustment. Dissociation is a crucial strategy that protects a person during a crisis, unfortunately, trauma survivors often rely too heavily on dissociation whenever they feel stressed in a situation, it can become their automatic freeze response to stress. Numbing the body is not an advantage when a person is called to live in the world, because it can impair their ability to take appropriate fight or flight responses if faced with any threat from outside the self. Of course, there are varying levels of dissociation, from day dreaming to fantasy, from leaving one’s body to derealization (the constant experience of dissociation). In the therapy room, dissociation severely diminishes the client’s ability to be present to the process, if it goes unchecked it may become a stumbling block. The therapist needs to go slowly at first, building trust and safety so as not to derail the person’s system. By explaining what dissociation is, the therapist can gently bring the client’s attention to when they are “leaving”. Taking time to build and practice new skills (in a playful way) as the go. The sequelae of narcissistic abuse may include any of the following symptoms: low self-esteem, self-mutilation (self harming), suicidal thought, chronic pain, PTSD, depression and somatizations. Somitizations are a variety of physical symptoms that the victim may have experienced, and usually they will go to their doctor to get relief from their symptoms. Most doctor’s are unable to give a true diagnosis of what is really happening, as they can not classify the symptoms as they don’t have any identifiable physical origins. When there is no detectable organic pathology evident, the person is often diagnosed as having a “psychosomatic illnesses”. Somitizations pose a major problem to the narcissistic victim’s general health. Many of the symptoms of their ill health are a direct result of their repressed memories from their narcissistic abuse, usually from childhood. For example, a child might get severe cramps in response to the fear experienced by the narcissistic abuse, then as an adult they may wake up with cramps for no apparent reason that the doctor can find. In this case, it is more likely that they are accessing repressed memories that they are not aware of, but their unconscious is now desperate to cleanse itself. These clients with somatization disorder will typically have visited many doctors in pursuit of effective treatment, and many informed doctors do recognize that often the underlying cause is emotional, and they are then likely to refer the person on to a psychotherapist. Very often the symptoms are cured once the underlying emotional cause is identified, and the repressed memory has a chance to surface in order to be released in the safety of the therapeutic space. Clients who have suffered narcissistic abused are likely to demonstrate feelings of shame, and humiliation, this is partly due to the narcissistic abuser projecting their shame on to them. They also tend to be over responsible, and apt to self-blame, this is because they learned to take responsible for the narcissists behaviour. Whenever the narcissist’s rage is triggered, without any doubt the victim is told it is their fault (i.e “It’s your fault, you should have known that was going to upset me, now look what you have done”) They may act inferior or powerless, and feel great guilt when talking about their perpetrator, even to the point of wanting to protect them. They will often act with disgust at themselves, thinking they are not good enough, smart enough, pretty enough etc. Victims often find themselves being victimized by more than one person. They may talk of a second relationship that mirrored the same experience as with their first perpetrator. Quite often the first narcissistic injury is experienced in childhood. It may have been a parent, grandparent, sibling, friend of the victim etc. Having been re-victimized they often internalize that there is something wrong with them, and that they deserve this kind of abuse, and resign themselves to that fate. It may become apparent that they may not have reached their potential in their personal life, or their professional life, this is partly due to the fact that they always had to stand in the shadow of the aggressor, and not upstage them. They learn to live in the shadows without really knowing why. These are some of the signs you can look out for. But there are more complicated symptoms still to be revealed that will need more of a greater explanation. Any of these symptoms mentioned above you might find in any client, however when they present themselves in a cluster, you will start to identify a syndrome emerging. You will identify many of the symptoms of trauma (avoidance behaviour, loss of interest, feeling detached, sense of a limited future, sleeping or eating difficulties, irritability, hypervigilance, easily startled, flashbacks, hopelessness, psychosomatic illnesses, self-harming, thoughts of suicide etc). In the course of your work together, you may also become aware that the victim always seems to defend their abuser. While the situation would not make sense from a social standpoint, it may make absolute sense from a psychological viewpoint. What you may be witnessing is a psychological condition known as “Stockholm Syndrome“. Stockholm Syndrome involves the victim emotional bonding with their narcissistic captors, this “trauma bonding” is known to be a strategy of survival for victims of narcissistic abuse and intimidation. In such a hostile environment, the victim soon learns that their abuser does carry out threats, so they are in real danger. Threats to their physical or psychological survival terrify them, leaving them feeling lost and isolated. But then, confusingly, they can also receive small kindnesses from the abuser, which make them feel connected again, connection makes them feel safe once more. It will be important to understand the components of Stockholm Syndrome in order to understand why the victim still wants to support, defend, and even love the perpetrator after all that they have gone through. This is a highly unconscious sophisticated source of defense for survival that needs to be applauded. Sometimes therapists will ask the client why they stayed in such a dysfunctional relationship for so long. This is not a good thing; it also tells me that the therapist does not understand a process called “Cognitive Dissonance“. Cognitive dissonance is another unconscious defense mechanism employed for survival. As you can imagine, living in a torturous war zone, where all forms of power and control are used against you (intimidation; emotional, physical and mental abuse; isolation, economic abuse, sexual abuse, coercion, control etc. ), the threat of abuse is always present. Coping with these states of mind throw the victim into any number of inner conflicts where defense mechanisms are called for. For example, a woman who is abused by her narcissistic spouse will hate the conditions she is living in. However with the real fear of a violent reprisal from her narcissistic captor if she tried to leave, she will more likely choose to stay put. The cognitive dissonance shows itself through rationalization: On the one hand: she abhors her unhealthy relationship and all the abuse that goes with it; while on the other hand, she tells herself that he only fights with her because he loves and cares for her. This inner dialogue reduced her anxiety, allowing her to bond with her abuser, to the point that she will even protect him from the outside world if people attempt to rescue her or encourage her to leave. The result of that is a massive draining conflict ensues between the person’s emotional self and their rational reasoning self. Their “cognitive dissonance” is a sign of the disharmony the victim is experiencing as a result of two conflicting ideas going on at the same time; i.e. the victim knows that they should get out of the abusive situation, but they also know that to do so will put them (and possibly their children) in great danger. When these two strategies are in place (Stockholm Syndrome and Cognitive Dissonance), the victim firmly believes that their relationship is not only acceptable, but also vital for their survival. They become so enmeshed in the relationship with the abuser, that they feel that their world (mental and emotional) would fall apart if the relationship ended. This explains why they fear those people who attempt to rescue them from their abuser, and how this creates the victim to develop cognitive dissonance and become protective of their abuser. As you (as therapist) continue to work, another symptom you may become aware of is how the client seems to be feeling uncertain of themselves, constantly second guessing themselves, even in the smallest matters. For example, as you open the door to your client, you might find that they always check “is this the right time for our appointment?” Another thing you may pick up on is, even after discussing something with them in detail, they want further clarification that they are hearing you right. There confidence is so low that they have trouble making simple decisions. You need to be aware if this is happening, because you may be getting a glimpse of another severe symptom of narcissistic abuse called gaslighting. Gaslighting is a technique of psychological abuse uses by narcissists in order to instill in their victim’s an extreme sense of anxiety and confusion to the point where they no longer trust their own memory, perception or judgment. Gaslighting can happen in any relationship between any gender. It merely requires two people, the gaslighter (the narcissist) and the gaslightee (the victim). The gaslighter needs to be right all the time, that is how they keep their power and sense of self in tact; while the gaslightee gives away their power to the gaslighter because they seek their approval in order to stay safe. That exchange allows the gaslighter to define the gaslightee’s sense of reality. “The Gaslighting Tango” is one of the narcissist’s games that happen gradually over time, it is a game (or dance) that allows them to define and shape their victim’s reality by eroding them mentally. To the victim, the gaslighting starts with the stage of disbelief, i.e. something happens in the gaslighting exchange that seems odd to them, and they can’t believe that it has happened. In the next state it moves to defense, at this point the victim still has enough of their self to fight and defend themselves against the gaslighting manipulation, however they are told things each time that end up confussing them, (i.e. “You’re too sensitive”, “are you mad”, or “I never said that, you’re imagining things?”). Or the narcissist may play tricks on them, moving or hiding things, and when the victim asks them if they have moved the object, they deny it, saying they never saw it. Gradually the victim, unable to work out the game, finally begins to doubt themselves. The final stage is depression, and by now they don’t even recognize who they have become, and they feel broken and isolated. They begin to feel that they can’t do anything right any more, they don’t feel that they can trust their own mind, and they withdraw with a skewed reality of what is really taking place. The techniques for gaslighting are powerful, mind-games; they are similar to certain forms of brainwashing, interrogation, and torture formally practiced by Central Intelligence Agencies and Religious Cults for decades. The narcissist uses gaslighting as a deliberate and cruel way to manipulate the victim into thinking that they are loosing their mind. They bombard the victim with such uncertainty that eventually they are unable to trust their own perception anymore. When they reach this state, they begin to doubt everything about their own selves, their thoughts, their opinions, their ideas, their ideals. Often they think they are loosing their minds, and they become very co-dependent on their abuser for a sense of reality. This is a quick exploration of the complicated subject of Narcissistic Victim Syndrome, and hopefully I have demonstrated the need for a therapist to have a good working knowledge of the “isms” of what Narcissist Personality Disorder entails. It is my opinion that without this knowledge the therapist would not be informed enough to be able to take the victim deep enough into their own story. They need to educate the victim about narcissistic behaviours so that they can make sense of the long painful journey they were on with their narcissist dance partner (whether it is a parent, sibling, friend, co-worker etc). Without putting these separate parts together (personal therapy and educational therapy), I fear that it would leave the victim vulnerable to future re-victimization. Many victims seem to progress from crisis to crisis, making them particularly at high risk of re-victimization. This is because the victim will continue to attract narcissists like a moth to a flame because they have been well groomed in their responses, this leaves them looking like obvious willing partners to the convoluted dance with the narcissist. Of course, this is far from the truth, because the victim is totally unconscious of there being any dance going on, they are totally oblivious to the fact that they are a partner in the dance. This ignorance leaves they open to the danger of forming another dangerous liaison and be victimized yet again.